This September, the first two episodes of Marvel’s Inhumans will premiere on IMAX screens before heading straight to ABC where they’ll air with some additional material before the next six instalments follow. Big money has been spent to ensure the show feels like more than just your average comic book TV series, and while we still haven’t seen any footage from it, some new photos have found their way online today as shooting continues in sunny Hawaii. You’ll have to squint, but look at the images embedded in the Tweet below and you’ll notice that we now have a first look at Medusa (Serinda Swan) alongside Black Bolt (Anson Mount). 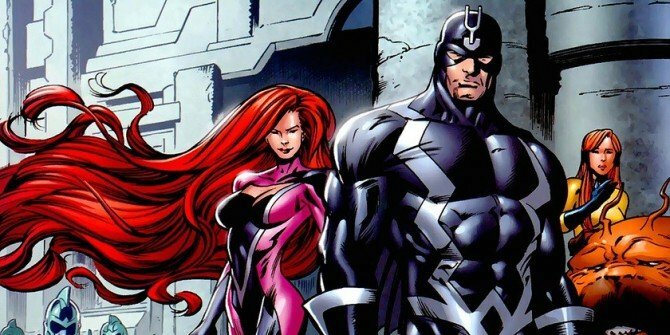 We sadly only see the Inhumans star from behind, but her flowing red locks are on full display along with a purple costume which should be instantly recognizable to fans of the comic book character and Queen of the Inhuman royal family. It remains to be seen whether or not these are the character’s final looks or just what they wear while out and about. The first look at Black Bolt on the show’s set was widely considered a disappointment, especially as his mask was nowhere to be seen and he looked like he’d fit right in in an episode of Agents of S.H.I.E.L.D., but we’ll reserve our final judgement until we get something official. With any luck, photos from Inhumans will continue to find their way online and at least one of the amateur photographers will invest in a decent camera lens. In the meantime, tell us, what do you think of this first look at Serinda Swan as Medusa on the set of the Marvel series? Sound off in the usual place.